When BioShock was released in 2007, it was an amazingly beautiful game on various levels. 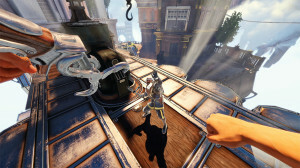 Graphically, the underwater city of Rapture dazzled with its art deco style. More importantly, the story was fantastic to play through. 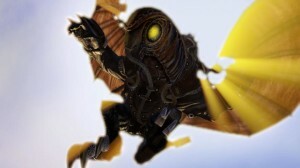 BioShock 2 was a fine effort and was certainly enjoyable, but it didn’t quite match up to its predecessor. 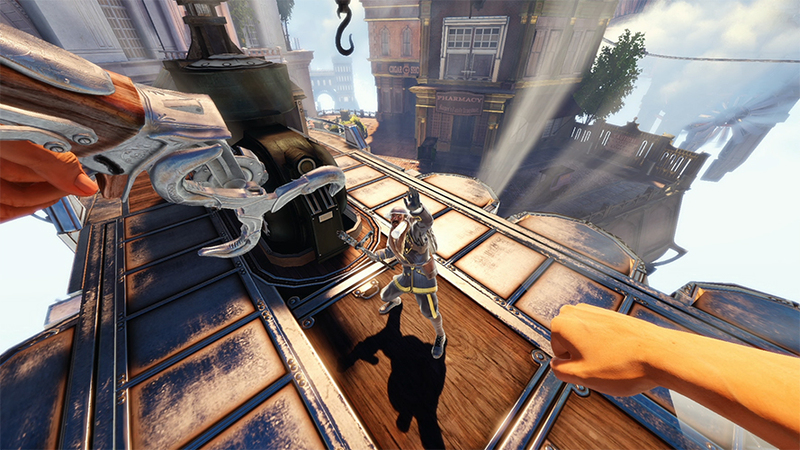 BioShock Infinite is its own effort, presenting brand new characters and a new story. Just how well does it stack up? Incredibly, incredibly well. 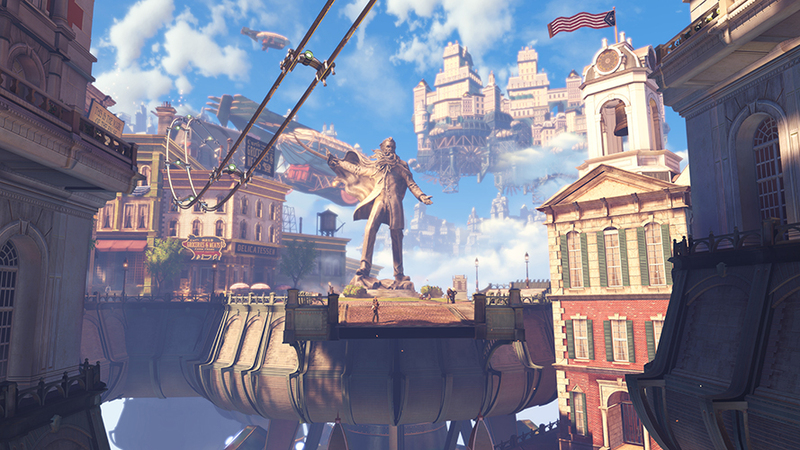 BioShock Infinite takes place in the floating city of Columbia. It’s a city meant to represent American exceptionalism; a city where George Washington, Thomas Jefferson and Benjamin Franklin stop just short of being gods. It’s an American utopia, meant for those that are (literally) above everybody else. But that’s not quite what you find upon arrival. You are Booker DeWitt, a disgraced former Pinkerton detective who has drank and gambled his way into a massive debt. To settle his debt, he must find and return Elizabeth, a young woman held captive in Columbia for most of her life. But to do so, you’ll have to enter a Columbia that is slowly becoming ravaged by civil war between the Founders and the Vox Populi. The Founders are upper class and pure Americans; the Vox Populi are the working class folk and minorities, led by Daisy Fitzroy. Your main concern, though, will be Zachary Hale Comstock, leader of Columbia and seemingly self-proclaimed prophet, who is fanatically idolized by citizens, primarily through scare tactics. Comstock keeps Elizabeth locked up tight and under the watch of the Songbird, a gigantic winged, mechanical creature. Comstock considers Elizabeth the city’s lamb; the future of his will. Unfortunately for you, Booker, you are the False Shepherd who will lead her astray. And you must be dealt with. 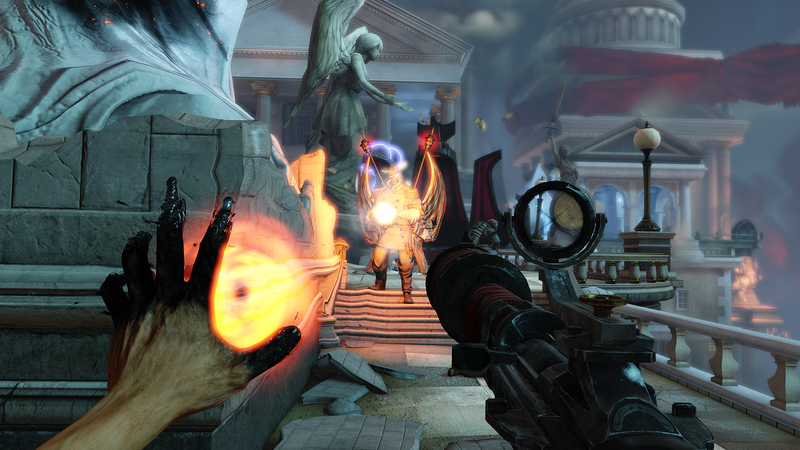 Much like the original BioShock, BioShock Infinite is driven by an incredibly strong story. But what I felt helps Infinite’s cause is that your tasks are driving the story more than before. The story feels enjoyably complicated. It’s lengthy, consistently engaging and well paced. In BioShock, the story would temporarily slow down to find Little Sisters and take down their associated Big Daddies; it occasionally felt like just enough of a chore. I never felt that way with Infinite. The plot progressed smoothly and bounced around at just the right times. Every voxophone, kinectoscope and code book you find furthers what you’ll learn about Columbia. Each thing you learn and explore tends to have an immediate effect; you don’t need to necessarily wait until the end of the game for things to make sense. The primary story itself kept me engaged and guessing until the end. The payoff was far more than worth it. Playing as Booker is a completely different type of experience. He’s not a faceless, mute character that you considering to be yourself. Having his own personality, it makes it harder to make a connection to him. However, the more you progress, the more obvious it is that it doesn’t matter. He matters for the story, but your connection should be to Elizabeth. She’s a well-written character and not your typical damsel in distress. Rather than being along for the ride, she’s the reason for the ride and is more than willing to move on without you, if need be. She'll make you care more about her than you will about yourself and it's something you'll want to buy into. Her strongest and most interesting element is her ability to control dimensional tears. Tears offer glimpses into alternate times and situations, which is about all I can mention without spoiling anything. Infinite is successfully able to pull off the “product of its time” aspect. Set in 1912, you are exposed to the various types of tensions, most of which are racial and based on previous wars and conflicts. You’ll come across a more sinister type of propaganda than what we’ve seen in Rapture and encounter the plights of the Founders and the Vox Populi. Themes of purification, religious radicalism, xenophobia and a type of "Red Scare." It’s a believable alternative historic setting, considering this probably could have existed at the time if somebody was more or less handed a city (well, not necessarily a floating one). For as immersive as the story and setting might be, Infinite still feels awfully free. Exploration was easier to complete, though backtracking was at times necessary for optional objectives. The combat was a good fit for this new setting. Guns play a much larger part with Infinite, both with yourself and your enemies. Nearly every enemy has a gun, which at times can feel a bit overwhelming. Even on a normal difficulty, there was a persistent challenge from all angles. But you’ll be able to strategically use Sky Rails, freight hooks and Elizabeth’s tear assistance (typically in the form of sentry weapons, cover and medical kits) to even the playing field. And Infinite’s version of plasmids, called vigors and gears, help create a different type of dynamic. Vigors give you the ability to shock people (Shock Jockey), set them on fire/blow them up (Devil’s Kiss) or sic murderous crows (Murder of Crows) upon demand, but you can also use them as traps. For example, Return to Sender, which reflects projectiles, can be charged and thrown into an upcoming battlefield, allowing the vigor to capture bullets and project them back at the firee. At times, the vigors seem overly powerful. There were some moments where charging Devil’s Kiss immediately incinerated several enemies. However, because of the challenge you’re typically facing, it never cheapen the experience. Neither will Gear, which are wearable items can give you a boost in terms of damage or ammunition clip size. The only aspect I can consider a drawback are the attitudes of Columbia’s citizens. For the most part, they add some good color to the city. You’ll hear some interesting stories if you decide to eavesdrop. However, they don’t need to necessarily reflect your current standing. Even though you get tagged as the False Shepherd, you only receive so much reaction. Occasionally, you’ll have somebody tip off a guard about you. It would have been a much more interesting dynamic if you drew more of a reaction, testing to see how long you could stay in an area and what you could get away with. But, much of the responsibility relies on what you do. The NPCs seem a bit too disassociated at times. A perfect example was a woman in a shop I entered when avoiding gunfire. The woman continued to sweep her shop while I shot out of her doorway. It was funny, yet odd. This type of situation won’t necessarily take you out of the mood, but it is noticeable. 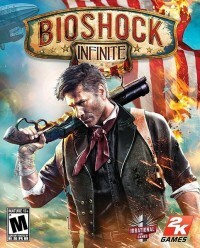 It’s hard not to compare BioShock Infinite to the original BioShock, but rightfully so. The original was such a great experience, it has its sticking power. It was memorable. Infinite is just as memorable and is easily on the level of quality. In some ways, it surpasses the original. There’s a certain flow it brings to the table that’s hard to beat. The more I played, the more I felt the need to keep going. What was the next checkpoint going to bring? What else was I going to have thrown my way? Infinite’s quality story is to thank for that. It has that wow factor; it had me constantly thinking about it after all was said and done. In all, it’s a complete package.